CyberGhost is claimed to be one of the best VPN services around. They say it is perfect for unlocking geo-restricted content, bypassing firewalls, online censorship, and remaining private while doing so. It is also claimed to be an excellent method of protecting your online traffic. If you are considering employing a VPN, CyberGhost specifically then you’re probably wondering if they’re any good? We aimed to find out so have been putting CyberGhost to the test. CyberGhost is a premium VPN service, meaning that you need to subscribe to one of its payment plans to use it. The service offers a great variety of plans, with the most basic one being the monthly plan, which costs $12.99 per month. Although the 1-month price is expensive, if you choose one of the other plans, and subscribe for a longer period, you can save up quite a lot of money. The next plan is a 1-year subscription, which will allow you to save more than 50%, at only $5.99 per month. The 2-year plan is even cheaper every month, at just $3.69. The most beneficial of the plans, one which will allow you to save up as much as 79% is a 3-year subscription, which will only end up costing you $2.75 per month. You get the same benefits for every one of them, and you can pay via credit card, PayPal, or Bitcoin. CyberGhost works on a wide variety of devices and systems, and it has both mobile and computer apps. When it comes to mobile apps, CyberGhost features a dedicated app for both, Android and iOS, which can be used on a wide variety of different devices. The Android app provides total privacy with a single tap, which is what it takes to activate the application. It will give you access to all of its servers, including the special streaming ones, which feature blazing speeds for movies, tv shows and other video media. It also keeps no logs, you can connect 7 devices at once, and it will protect you with a 256-bit AES encryption, unlimited bandwidth and traffic, and an auto-protect feature for when you have to connect to public Wi-Fi. It will also work on tablets and all other Android systems. As for the iOS app, CyberGhost offers pretty much the same benefits, including protection for iPads, iPhones, iPods, and even Apple Watch. There aren’t too many options on the mobile apps, but they do offer an ‘Ad-Blocker’, ‘Protection against malicious websites’, ‘Data Compression’ and a feature to ‘Prevent online tracking’. Whatever device you may be using, CyberGhost can protect them all, and up to 7 of them at once, too. All are simple to connect and use, which makes it one of the best services for new users as well. When it comes to its desktop and other apps, CyberGhost provides coverage for even more devices and systems, including Windows, Mac, Amazon TV, Amazon Fire Stick, routers, and even extensions for Chrome and Firefox. These apps feature access to all of the servers CyberGhost offers, all of which provide high speeds and are easy to connect to and use. Desktop and laptop apps are available for all devices running Windows or Mac OS. The app itself is very intuitive and user-friendly, and all it takes to activate it is a single click. Due to decent speeds, CyberGhost apps are perfect for streaming, with no buffering and other irritable inconveniences. I liked the ‘Streaming Friendly’ option that has dedicated servers for specific streaming services like Netflix and others. Further, it supports torrenting and other forms of P2P file sharing, which is not something that all VPNs tend to do. The apps will also allow you a Smart Rules feature, which you can use to create your own privacy rules. These apps also keep no logs, they use multiple top-security protocols, strong encryption, offer a kill switch, and customer support which is available in 4 languages. You can reach customer support at all times, just in case you run into a problem. You can contact them via email or live chat. When it comes to servers, CyberGhost has a massive network of 3,727 servers, spread around 60 countries. The service covers regions all around the world, and with it, you can reach pretty much any continent. North America, Australia, and Europe are covered almost entirely, with extensive coverage in South and Central Americas as well. As for Africa and Asia, the service covers a chosen few countries, but enough for everyone to find what they need. Some of the most sought-after locations include Japan, India, Australia, Canada, the US, the UK, Denmark, the Netherlands, Brazil, France, Germany, among others, all of which are covered by CyberGhost. With this service, you can unlock virtually any service or website on the internet, which is one of the reasons for its popularity. CyberGhost is one of the best services for unblocking content from around the world. Across their range of apps they have specific servers to connect that will unblock specific content. In our tests, they worked with all the most popular services including the likes of Netflix, BBC iPlayer, DAZN, YouTube TV and a whole host more. The dedicated ‘Streaming Friendly’ section makes it quick and easy to connect to the correct server to unblock the service you want to access. Speeds are of great importance for a VPN service, as it doesn’t mean much to protect yourself and then not be able to do anything. With that in mind, CyberGhost offers some pretty decent speeds, as well as special streaming servers which we covered above. 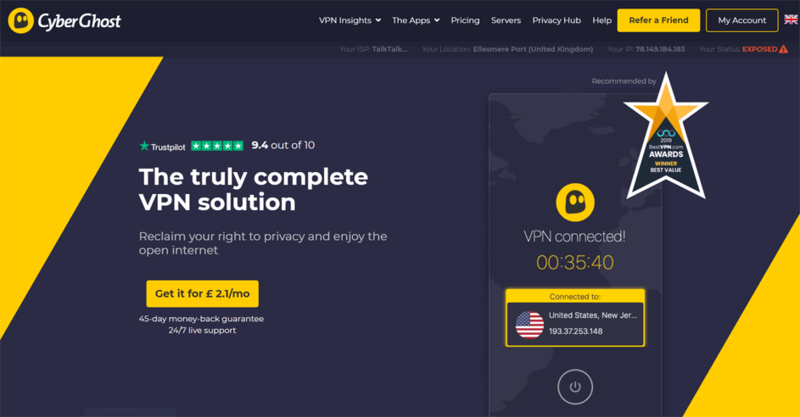 Its speeds are not the best ones in the VPN industry and while we didn’t have any trouble carrying out regular internet tasks or streaming high-quality video we have tested faster services. We put CyberGhost to the test by downloading a test file from a residential connection. Our speed without using a VPN was: 62.52 Mbps. We achieved the following speeds connected to CyberGhost’s servers. Overall the speeds achieved were not too bad. 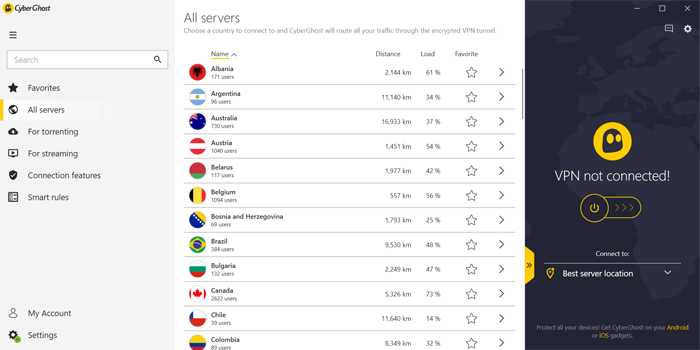 However, at distance CyberGhost failed to live up to the speeds offered by other services like ExpressVPN or NordVPN. We struggled with servers at a distance, especially their Australian server which produced some of the worse speeds we’ve seen. Nearby locations faired better and although slightly slower than what else is available they performed to a satisfactory level. CyberGhost is still more than operational, and it will allow you to remain wholly secure and still browse the web, download files, use torrents, stream videos in high quality, and so much more without feeling too many difficulties. A lot will depend on your internet speed, of course, but our tests have shown that CyberGhost does a decent job albeit for one or two blips. So, with all of this in mind, is CyberGhost a good service? We believe that it is. It offers an excellent variety when it comes to its packages, with significant discounts on its prices. The longer-lasting plan you choose, the less you will have to pay, and at the same time, you will not have to worry about your VPN for a long time, particularly if you choose a 3-year plan. Subscribing for such a long time isn’t without risk though as service quality can change. However, CyberGhost is a reputable brand and so shouldn’t suffer such issues. CyberGhost also covers a wide variety of devices and systems, with dedicated apps to match each of them. 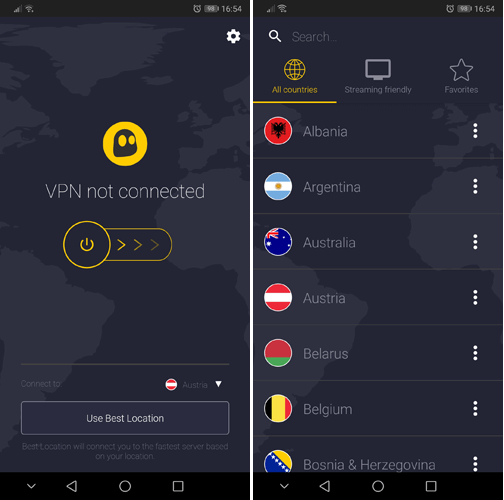 Its mobile apps are perfect for those who tend to travel a lot, as they can protect you, even if you have to connect to the public Wi-Fi. They are also perfect for streaming via mobile in a safe way. As for the desktop and other apps, they are also quite easy to use, with a wide variety of security features which will make your browsing experience much safer. An additional plus for this service is the fact that it keeps no logs and it supports torrenting. Then, there are servers, with CyberGhost offering over 3,700 of them in 60 countries around the world. Its servers are located on every continent apart from Antarctica, which should provide you with near-ultimate reach, and the ability to unlock any content. CyberGhost’s speeds aren’t the best we’ve seen, but neither are they the worst. Although they don’t match the standards of some other services, they are fast enough for most uses. Overall CyberGhost offers a very reliable service and if you can accept some minor speed loss then they’re a very affordable and reputable service.